Take one aspiring cook, one judge, and a spoonful of romance… When Zoe Harper wins a coveted place in a televised cookery competition she’s thrilled. It’s a chance to cook her way to fame and fortune and the little delicatessen she’s set her heart on. The first task has hardly begun when she finds herself with rather too much on her plate. Not only has she got to contend with the fiercely competitive and downright devious Cher, but she’s fast developing an inconvenient crush on one of the judges – the truly delicious Gideon Irving. All too soon there’s more than canapés, cupcakes and cordon bleu at stake. Will Zoe win the competition or is Gideon one temptation too far? And is Zoe really prepared to risk it all for love? Altså.. Selvom jeg godt vidste, jeg havde fat i en chick-lit og læs-let-bog, så var denne alligevel lidt for tyndbenet.. Selvstændig kvinde får omvendt alle og ender sammen med byens hunk.. Mnja.. Synes egentlig, jeg normalt bliver bedre underholdt af Katie Ffordes bøger, men måske er det bare noget, jeg drømmer? Emily is happy with her life just as it is. She has a career as a midwife that she loves . She enjoys living on her own as a single woman. But she’s also feels it’s time for a change and a spot of some sea air. 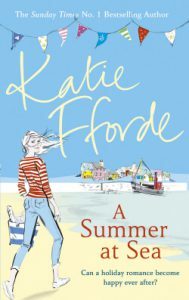 So when her best friend Rebecca asks whether she’d like to spend the summer cooking on a ‘puffer’ boat just off the Scottish coast, she jumps at the chance. But she barely has time to get to grips with the galley before she finds herself with a lot on her plate. Rebecca is heavily pregnant and is thrilled to have her friend on board doing most of the work. Then there’s Emily’s competitive and jealous kitchen assistant who thinks she should be head-cook, not Emily. And there’s Alasdair, the handsome local doctor who Emily is desperately trying not to notice. Because if she falls in love with him, as he appears to be falling for her, will she ever want her old life back again?